*We definitely do not recommend putting headphones on a newborn or baby. The “Mozart Effect” has been pretty widely debunked by scientists. 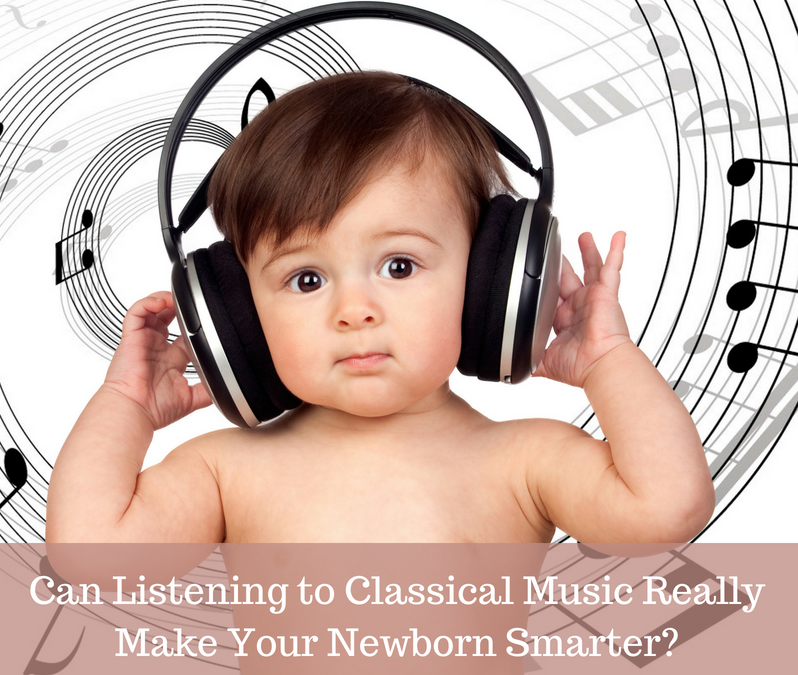 Newborns + classical music will not equal a genius child. In most studies, the IQ level of people who were exposed to classical music early on and those who weren’t were the same. But, that doesn’t mean there are no benefits! The perks to exposing your child to classical music may just lie in their interaction with you and with instruments themselves. Here are a few great ways to incorporate music (classical and otherwise) into your baby’s routine! Music is just fine when you are passively listening to it, but when it comes to it truly benefiting your baby, the secret may just be your engagement. Humming or singing along, dancing together, and using instruments are great ways to take music to a new level. Anytime you use music to engage with your baby in any way, you two are bonding and spending quality time together- and isn’t that what it’s all about? Listening to music is great for baby’s pre-language skills. Especially when songs are repeated and actions are used. Again, it’s a great way for you to bond with baby as well! Mix it up- listen to all kinds of music. Classical, top 40, and those fun baby songs and nursery rhymes- you’ll both have a blast and baby will be hearing a wide variety of words in a fun way, and some studies have shown that this can help baby to learn them more quickly. Fun actions and fingerplays are great for fine motor development as well! And don’t forget all that wiggling, jumping, and dancing for gross motor too. Who doesn’t brighten when a good tune is played? Music can have a powerful boost on baby’s (and parents!) mood. Especially if parents are engaging along. Fill your home with music, and baby is sure to give a few extra smiles and giggles! Lullabies are a great way to soothe baby. Great for a fussy baby anytime, and perfect for setting the mood for sleep. And you don’t need an MP3 for that one- use your own beautiful singing voice! Whether you’re hitting the right notes or not, baby doesn’t care. She just loves hearing your voice set to a soothing song. Cultivating an early love of music is great for any infant. There are so many great benefits. And an early love of music may just help your child when it is time to learn to play an instrument- which many studies show DOES make your child smarter!